Father’s Day weekend I watched my two nieces. We were planning to go to my grandparents for a Father’s Day get-together, so I thought we could make cookies for my grandpa, my dad, and my brother. When I mentioned we would make some cookies, my 4 year old niece jumped at the chance. She loves to bake and “cook” with her mom! So we pulled up a chair to the kitchen island, pulled out all the bowls and baking stuff, and the baking fest began! 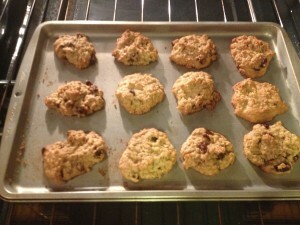 It has been awhile (like years) since I have made these chocolate chips cookies. I forgot how good they were! I am not going to let years pass before I make these delicious cookies again. They will for sure be put on my regular baking rotation!! Combine butter and sugar. Cream until smooth. Beat in eggs. 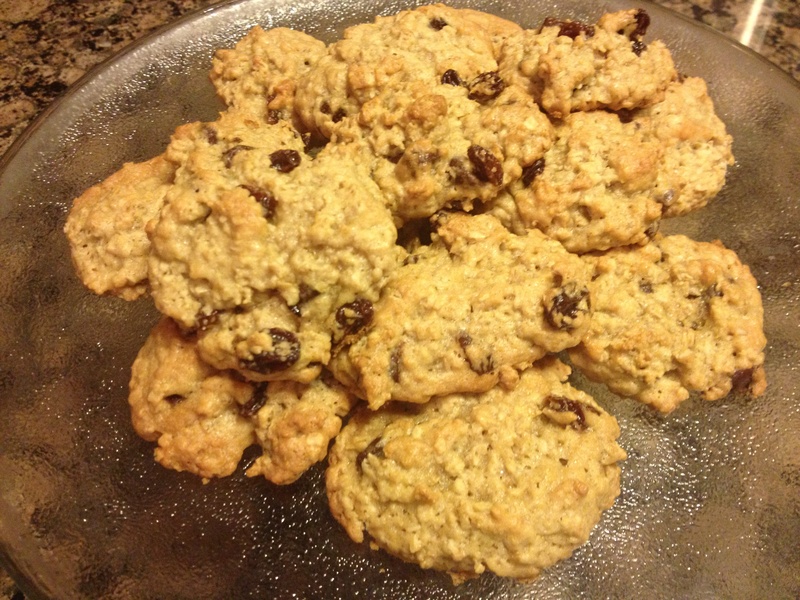 Mix in rolled oats, chocolate chips and raisins. Drop into rounds on cookie sheet. Bake for 15-18 minutes. (Yes, it really does take that long!) If you like a softer cookie, bake closer to 15 minutes. If you like your oatmeal cookies a little crunchy, bake for 18! This entry was posted in Recipes and tagged oatmeal cookies, oatmeal raisin chocolate chip cookies. Bookmark the permalink.